Born in Goleta, California on November 12, 1913, veteran slugger GENE LILLARD, 33, is new to the East Bay. Gene, who also takes a hand at outfielding and catching, whacked 22 homers while batting .268 for Sacramento last season. His biggest season was ‘35 for the Angels, when he socked 56 circuit clouts, drove in 147 runs, and batted .361. He has toiled in the majors for the Chicago Cubs and St. Louis Cards. Also played for the Seals, Rochester and Wichita. 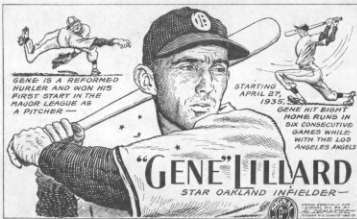 "Gene" attended school in Santa Barbara where he scored high in athletic achievements winning three letters in baseball, one in football and one in basketball. Versatility is his middle name as he has been pitcher, catcher, third baseman, or "what have you.". Gene has been in professional baseball since 1932 when he started with Wichita, Western League. In his first professional game he hit a home run and single in one inning: an inning in which his club scored 17 runs. He was later with the majors as a pitcher. His wither occupation is farming. Hunting and fishing are his hobbies. He has brown hair, blue eyes. His father is a Justice of the Peace. Professional Baseball Experience: 1932, Wichita, Western League, Los Angeles, P.C.L. ; 1933-34-35, Los Angeles, P.C.L. ; 1936, Chicago Cubs, N.L. ; 1937, San Francisco, P.C.L. ; 1938, Los Angeles, P.C.L. ; 1939, Chicago Cubs, N.L. ; 1940, Los Angeles, and St. Louis Cards, N.L. ; 1941-42, Rochester, International League, and Sacramento, P.C.L. 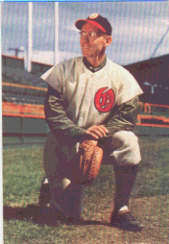 ; 1943-44-45, Inactive in baseball; 1946, Sacramento, P.C.L.